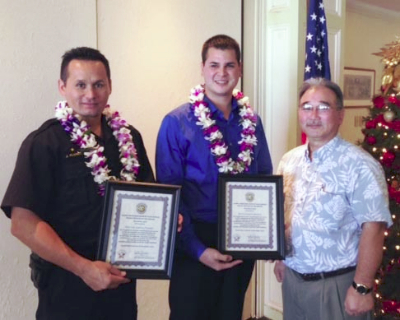 Hilo Exchange Club President Jay Kimura presents "Officer of the Month" awards to Joshua Flores and Kevin Brodie for November. 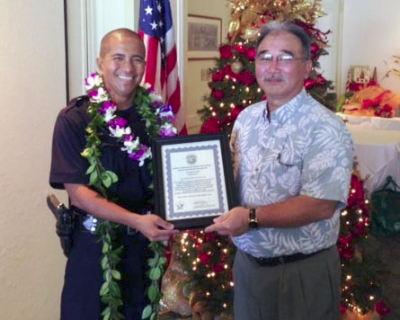 The Aloha Exchange Club of East Hawaiʻi recognized Puna Patrol Officers Joshua Flores and Kevin Brodie on Thursday as “Officers of the Month” for November and South Hilo Patrol Officer Keith Nacis as “Officer of the Month” for December. Flores and Brodie were honored for capturing a wanted suspect who had been evading police. Nacis was recognized for his traffic enforcement efforts. In September, a woman reported that she had been beaten, choked, restrained and threatened by her abusive and controlling boyfriend. When she tried to use her phone to call for help, he ripped the phone out of her hands. Police attempted to track down the suspect, but he managed to evade them. On October 3, Officers Flores and Brodie checked a home in the Hawaiian Paradise Park subdivision in Puna. The suspect made a run for it with Flores and Brodie following in a foot pursuit. 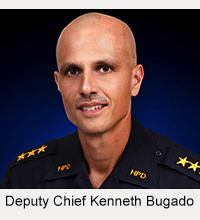 The two officers relentlessly pursued the suspect by traversing two barbed wire fences, climbing a chain link fence and running through thick brush. Both officers were injured from the barbed wire but continued chasing the suspect until they caught him. He was arrested and charged with kidnapping, robbery, phone ripping, four counts of abuse of a family/household member, two counts of terroristic threatening and five counts of violating probation. Nacis was honored for his initiative in traffic enforcement. 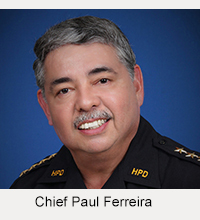 In October, he issued 163 citations that accounted for 256 traffic offenses, included 59 for speeding, 43 for moving violations and 10 for seat belt violations. During the same period, he arrested 13 motorists for driving under the influence. His constant presence on our roadways acts as a visual reminder for motorists to drive with care and serves as a deterrent to those who would otherwise take unnecessary risks that could result in tragedy.